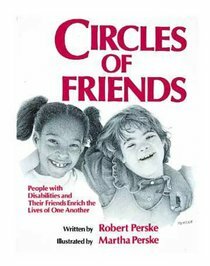 - Publisher In this warm, sensitive collection, Robert and Martha Perske offer true stories and issues to ponder, concerning Circles of Friends-friendships between people with disabilities and so-called normals. They show how these circles cut across age groups, generations, and races, and how the hearts and worldviews of everyone can be enriched. The emphasis here is on pure and simple friendship. Book jacket. - Publisher This inspiring book presents a sensitive collection of stories with beautiful illustrations. In this warm, sensitive collection, Robert and Martha Perske offer true stories and issues to ponder, concerning Circles of Friends-friendships between people with disabilities and so-called normals. They show how these circles cut across age groups, generations, and races, and how the hearts and worldviews of everyone can be enriched. The emphasis here is on pure and simple friendship. Book jacket. This inspiring book presents a sensitive collection of stories with beautiful illustrations. Robert is widely known for his work on behalf of people with disabilities. In 1968 he received a Rosemary Dybwad International Award, enabling him to travel and study attitudes toward people with disabilities throughout Sweden and Denmakr. In 1987 he and Martha Perske shared the Healing Community Arts & Letters Award at the United Nations in New York. The Perskes have collaborated on two major reports to U.S. presidents: Mental Retardation: The Leading Edge, for President Carter; and, in cooperation with others, Mental Retardation: Century of Decision, for President Nixon.